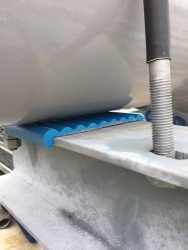 Lift-Off Pipe Supports, a Lake Charles, Louisiana Company, has recently successfully designed, manufactured and installed their new "LOR" range of pipe supports with excellent results (according to the installers and pipeline company owners). Lake Charles, LA, July 14, 2017 --(PR.com)-- Lift-Off Pipe Supports has recently designed, manufactured and supplied their 6" and 8" LOR (Lift Off Rest) range of pipe supports to a well know pipeline operating company with excellent results. The client is very impressed with the support as they do not fall off or get displaced during line expansion or contraction and very fast to install (about 15 minutes). An additional advantage is that the support cannot slide off the beam by using our patented design method. No drilling or any mechanical fixing method is required, besides lifting the pipe off the beam. No hot work is needed. The LOR is unique in the sense that it has a very high conductivity resistance, to ensure that the pipelines and associated equipment is adequately grounded. A major cause of cathodic protection failures. Lift-Off Pipe Supports supplied 6" and 8" LOR's to suit 12," 16," 20" and 24" piping. The advantage of the LOR is that the support barrier, or width only needs to be approximately half of the pipe diameter and addresses the contact point between the support beam and the pipe. Lift-Off Pipe Supports supplys the LOR to suit structural sections from 1" to 16" wide flange widths to suite piping up to 48."